It’s always tempting to go straight for the biggest, flashiest, most expensive model in a new smartphone range. And while we love the iPhone XS and iPhone XS Max, we have a massive crush on the iPhone XR. Some people might try to convince you that the iPhone XR is the runt of Apple’s latest litter, but not so. In fact, we gave the XR a 5-star review and for stellar reasons, some of which we’ll cover again below. Money talks, and nothing sounds better to our ears than a premium iPhone experience for less. The iPhone XR is £250 cheaper than than XS and £350 cheaper than the XS Max. This instantly makes the XR more appealing to those of you who want a top-notch Apple smartphone experience, without having to explain to your bank manager why you’ve dropped upwards of a grand on a phone. That dinkier price doesn’t mean Apple has cut any major corners to drive the cost down, though – the iPhone XR sports many of the same features found on the XS (we’ll come to that in a wee while). Apple is selling the XR with a starting price of £749 for 64GB, £799 for 128GB, and £899 for 256GB. If your current phone contract is up for renewal, there are some decent deals to be found on the Apple iPhone XR. Each day we check the best prices, which can be viewed below. If there’s one area the XR rules, it’s battery life. From our experience, it’ll easily see you through a day of intense use. With a lower-res screen than its bigger siblings, the XR doesn’t need so much power, which certainly extends the phone’s usage time. For the heavier phone users among you, the XR’s battery life is an important reason to invest. Why? It means you can get more done without worrying that your phone will give up the ghost before you’ve finished working/gaming/playing music/trawling Instagram. To put it into context, the iPhone XR has a battery capacity of 2,942mAh, compared to 2,658mAh in the iPhone XS. That’s not such a huge stretch from the 3,174mAh battery in the XS Max, either. And remember, the XR costs a lot less. 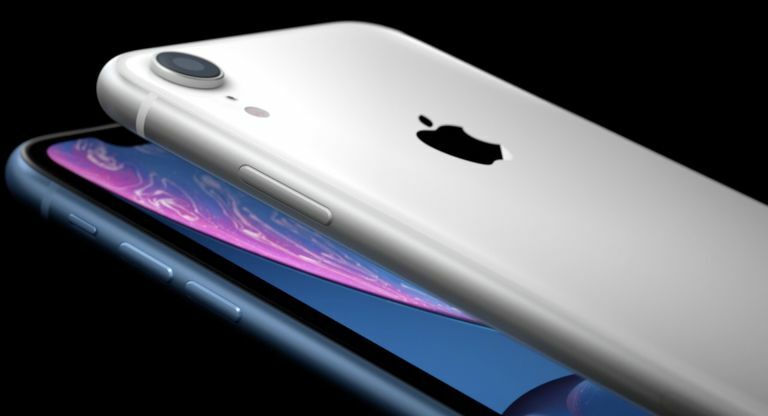 The iPhone XR is powered by Apple’s new lightning-fast A12 Bionic chip, capable of supporting five trillion operations per second. It also includes a next-gen Neural Engine dedicated to machine learning. That all sounds very fancy, but in essence it means the XR is fast, smart and built to perform exceedingly well, whether it’s helping you nail work on the move or dive into your latest mobile gaming obsession. The iPhone XR also comes with iOS 12, Apple’s latest operating system, home to that space bar trick, the very telling screen time insight, and a haul of new emojis (New llama! Lacrosse! Smiling face with triple hearts!). Oh, and do you currently have two phone numbers, one for work and one for personal use? Well, the iPhone XR offers dual-SIM support, so you can have a physical nano-SIM card in the phone, plus an eSIM. At 6.1 inches, the iPhone XR is the Goldilocks equivalent of displays: not too big, not too small. There’s a decent amount of real estate upon which to watch videos and to game, so content doesn’t feel cramped on screen. Multi-taskers will also be overjoyed to hear there’s support here for split-pane apps in landscape. And yes, we know some folks are sniggering over how the XR doesn’t have an OLED screen, and is instead rocking an LCD number (326ppi). But hey, Apple uses arguably the best LCD screens available, so it’s by no means a dull affair. Apple’s True Tone tech is also present, ensuring the white balance on screen is matched to the colour temperature of the light around you. The benefit is less strain on your eyes. Take that, Specsavers. Another juicy reason to get your hands on the XR is, of course, Apple’s enviable camera system. It’s one of the best around, and can truly elevate your stills and video skills. This could be especially important if part of your job involves taking product or reportage shots to share on social media. There’s a whole suite of camera features and modes to support you in capturing high quality images, including enhanced Portrait mode, with advanced Bokeh and Depth Control. Apple’s Neural Engine steps in again here, maximising the clout of that 7MP front camera, powering Apple’s smart TrueDepth camera system for Face ID, and 12MP wide-angle lens at the back. With features such as optical image stabilisation, Smart HDR, 1080p HD video recording and 3x digital zoom, the iPhone XR camera is a true ally for mobile photographers. So there you have it: five reasons why you should make the iPhone XR your next phone. Want to see how it compares with the other iPhones? Then check out our official best iPhones guide to get the lowdown on every iPhone Apple currently sells.